My friend Allison Davis came over for dinner with her son Zachary Friday night. They are vegetarians so I had plenty of veggies and salmon ready to go. Actually, not quite ‘ready’. More like, the food was in the ‘fridge and I knew I would eventually get my act together and fix dinner. Dessert was also planned out in a very loosey goosey way. I wanted to make a crisp because it is so easy to do and I knew I was pressed for time. 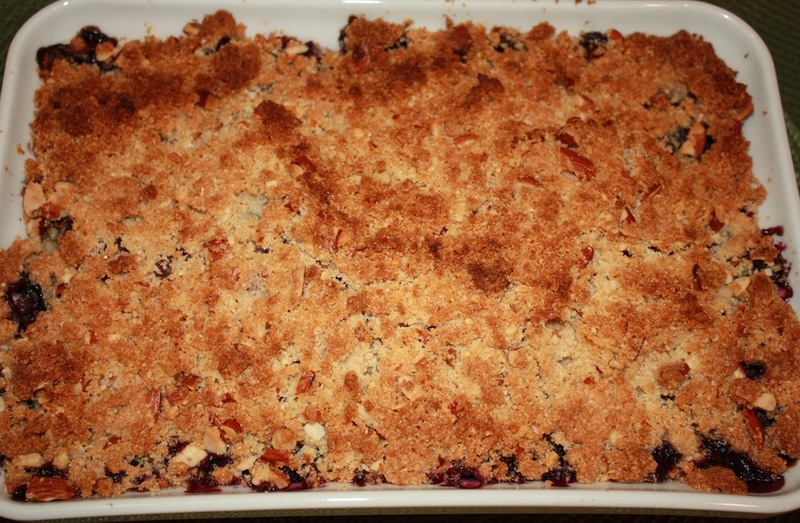 I decided to go with a blueberry crisp and try a new ingredient – almond flour. Why? Because I had never used it before and had no idea what would happen. I combined the almond flour with chopped almonds, sugar, brown sugar and butter for the topping and covered the gorgeous blueberries in a baking dish. 50 minutes later a fabulous dessert emerged. Really, those were her words. I think my expression was sending the message of, “Are you out of your mind?? ?,” but we moms have to stick together. Zachary and Samuel came into the kitchen, took one look at the dessert and called Ally’s bluff. So my dessert became known as Blueberry ‘Waffle’ Crisp with the ‘crisp’ barely whispered. I wish I could say that Zachary tried the Crisp, fell in love with it and begged for more, but heh, we are talking about a 7 year old who has a very clear sense of what he wants to eat. My epic failure, at least in the eyes of Zachary, turned into a tremendous success on Saturday when I brought some to share with my sorority sisters. Macaroni and cheese reviews from Zachary will always rate. Blueberry ‘Waffle’ Crisp reviews? Not so much! Preheat the oven to 350°. Set aside an 8" x 12" baking dish. In a large bowl, gently stir together the blueberries, all purpose flour, brown sugar and lemon juice. Transfer to the baking dish and set aside. In a large bowl, stir together the almond flour, sugar, brown sugar and almonds. Use your fingers to blend in the butter, but just until it is incorporated. You want the topping to have clumps. Cover the blueberries with the topping. Bake in a 350° oven for 50 minutes, rotating the pan front to back halfway through. Anxious to try this recipe as it is a gluten free desert and these are not easy to find. I am going to try this but may also try it as an apple crisp topping too. Can you make this with regular flour, not almond flour? Is it the same prorportion? I would not hesitate to substitute all purpose flour for the almond flour. Use the same measurement. Let me know what you think after you make the change! I LOVE the idea of trying it as an apple crisp topping. Let me know how it turns out! This sounds delish. But, I’m laughing out loud. My daughter love mac and cheese more than anything! !